Every once in a while I dig-out my collection of copies of historic Niagara Falls paintings. Attached is a drawing by August Kollner which he painted in 1850. 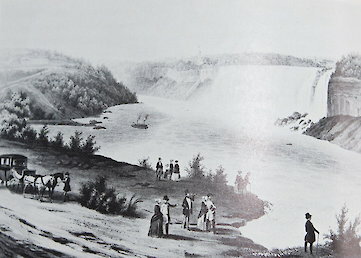 What you see in this sketch is elegant ladies and gentlemen looking towards the American Falls. Perhaps they have come along the river from the Clifton Hotel (at the foot of Clifton Hill) built in 1832-33.Below is the first Maid of the Mist built in 1846.You can also see the ferry landing on the Canadian side. Look carefully and you’ll see small row boats that travelled between Niagara Falls Ontario and the U.S.A. The vantage point for this sketch is Table Rock. You can see two people on the original table top. The last remnant of this rock fell into the gorge in 1850.